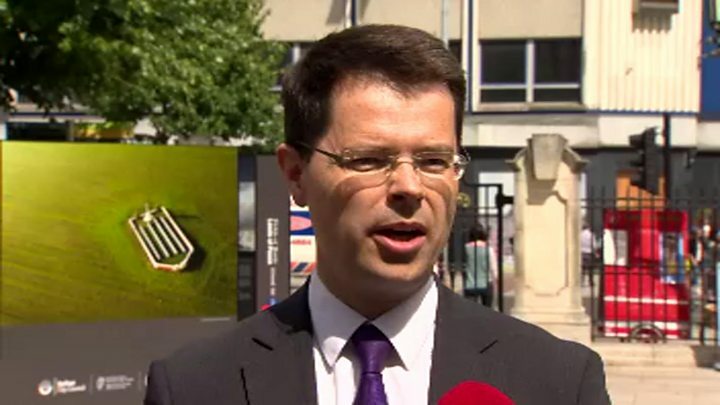 Northern Ireland Secretary James Brokenshire has said it is difficult to see how Northern Ireland and Scotland can remain in the EU. He was speaking at his first official engagement at Belfast City Hall where he signed a book of condolence for the victims of the lorry attack in Nice. Deputy First Minister Martin McGuinness and Scottish First Minister Nicola Surgeon want to stay in the EU. Mr Brokenshire also ruled out the need to hold a border poll. He said he had constructive discussions already with the Irish government. The secretary of state said both the UK and Irish governments were opposed to a return to border check points between the Republic of Ireland and Northern Ireland. Mr Brokenshire, who campaigned to remain in the EU, also said that after the referendum vote people need to unite and respect the outcome of the vote. He told reporters he would use his job to advocate the best interests of Northern Ireland at the heart of government. The new cabinet minister, who was previously at the Home Office, said legacy issues would be one of his priorities. Mr Brokenshire has already had conversations with First Minister Arlene Foster and Deputy First Minister Martin McGuinness. He is to have further conversations later and on Tuesday with the leaders of the SDLP, the Alliance Party and the Ulster Unionists.